Le Chai Duchet was established in 2013 by Alexis Duchet and his parents. Alexis is the seventh generation to work his family’s land in the village of Viré which is situated in the Haut-Maconnais, 18km north of Macon. The wines are fermented with their indigenous yeast and with low total SO2 levels. The Macon-Villages comes from parcels of very old vines situated on the lower elevations of the Viré slopes. In 1928, Alexis’ great grandparents joined with other wine growers of Viré to create a cooperative which enabled them to both vinify and commercialize their wines. Alexis’ parents were working with this same cooperative until they decided to build a small winery, “le chai duchet” and shift their focus to estate bottled wines. Alexis travelled extensively, doing winemaking stints in unusual places such as Margaret River and Ontario Lake, as well as closer to home in Meursault and the Savoie before returning to his family estate. He has since inherited 9.5 hectares from his parents; 7ha in Viré-Clessé and 2.5ha in Macon-Villages. The family stopped using chemicals in the vineyard during the 1980’s when they saw problems with erosion and for the last ten years the land has been farmed organically, despite the fact that the cooperative offered no extra money for the grapes. Alexis is continuing in the same philosophy. The delicious wines of the Macon-Villages appellation offer a great value alternative to the classic Pouilly-Fuisse appellation wines. Similar soil and climate to Pouilly and just a stones throw from the region, Le Chai Duchet offers so much. 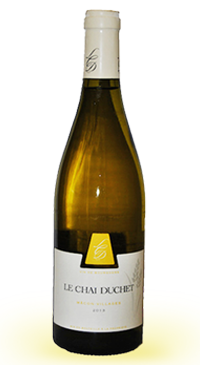 This is a refined, yet intense wine with aromas of white peach, dried honey and white chocolate that are beautifully entwined with the oak. The palate is rounded on the entry with fresh lime, apricot.